Photo by Freddy. The Finsteraarhorn seen from the north. 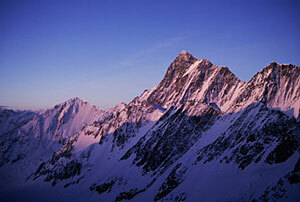 The highest and one of the most stunning looking peaks in the Berner Oberland. We climb the Mönch the first day and stay at the Moenchsjoch Hut. Day two we climb the Jungfrau and hike to the Konkordia Hut. We climb the Gross Grünhorn to the Finsteraarhorn Hut. The next day we climb the Finsteraarhorn and travel to the Oberaarhorn Hut. 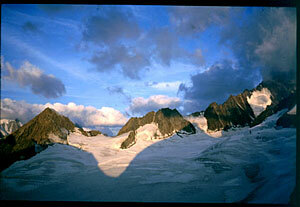 We climb the Oberaarhorn and hike out to Grimsel that day. The standard route is rated PD+ II-, or ZS, Ice 45 degrees. This tour is very strenuous and requires excellent physical fitness. If you want to go easier please see the glacier hike to Grimsel Pass. 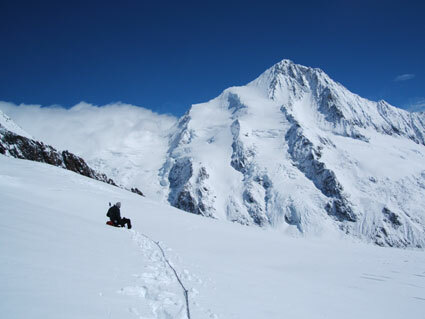 The climb, a 5-day tour, is on the largest glacier in Europe, the Aletschgletscher. The views are fabulous from the top. 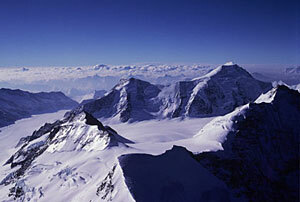 Climb the Jungfrau, 4158 m. and hike down the Aletschgletscher to the Konkordia Hut 2850 m.
4-5 hrs. to the summit and 3 hrs. to the hut. Climb the Grünegghorn or Gross Grünhorn 4044 m. and rappel down from the Grünegghorn and glacier travel to the Finsteraarhorn Hut, 3048 m. 5-6 hrs. to the hut. We climb the highest peak in the Berner Alps, the Finsteraarhorn, 4274 m. We will stay another night at the Finsteraarhorn hut. The climb is 4-5 hrs.